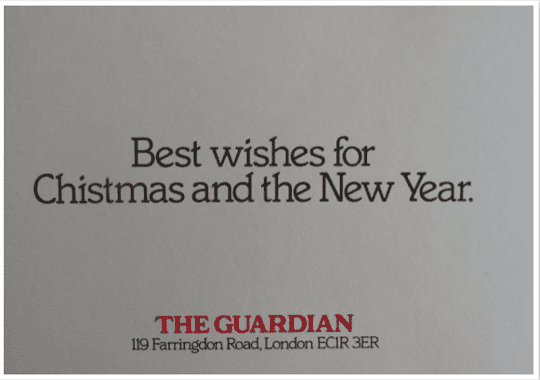 The official card from everyone’s favourite liberal-left news source, circa 1980. Don’t worry, someone noticed: it never went out. (And even if it had, the night shift would have fixed it for second edition). If you’re baffled by the headline, and perhaps reading “take drops” together, as I was, here’s some background. 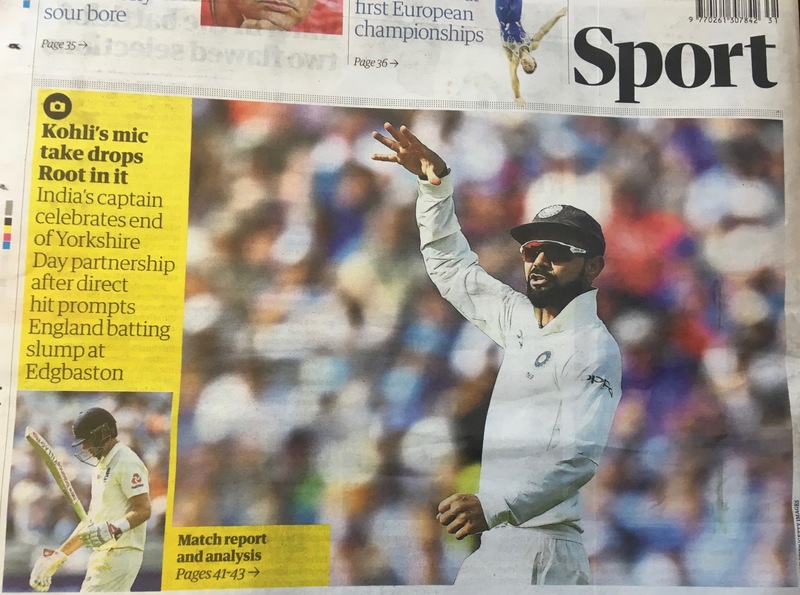 Earlier this summer, in the deciding match of the one-day cricket series between England and India, England captain Joe Root hit the winning runs, scoring a century as he did so, and then performed what appeared to be a rapper’s “mic drop” – the showy discarding of a microphone, with an air of finality, at the end of a show – with his bat. Then, last week, in the first of the five-day Test matches between the two countries, Kohli ran out Root with a direct hit when Root was unwisely attempting a second run. Kohli then celebrated in a similar manner, only with an imaginary microphone, because he didn’t have a bat. The TV cameras didn’t really pick it up, but more than one press photographer did, and the picture duly found its way onto several sports sections the next day, including the Guardian’s, with an “ooh, controversy!” angle to the copy, even though the players seemed very happy to play down the whole thing. But if you’re going to make mic drops the back-page story, you need to be sure that your audience understand what they are. Readers of the culture section might well be familiar with a gesture that was popularised in rap battles and comedy clubs, but this is a headline for followers of the most traditional form of Britain’s most traditional game: the sport whose VIP spectators wait to be given permission to take their blazers off in 95-degree heat. If the first time they encounter a pop-culture term is broken up in the middle of a complicated headline, the learning (and comprehension) curve is going to be almost vertical. If you do know what a mic drop is, it’s hard enough, because your eye jumps straight to “drops” after “mic” and ignores “take”; at first I thought they had left an entire rogue verb in the headline. It took me about 45 seconds to realise that (I think) you’re supposed to read “mic(k) take”, as in mickey-take. Of course, that would rely on you pronouncing “mic” phonetically and not as “mike”: but no one refers to them as “mick drops”. Moreover, “drop” has become semantically detached from its noun phrase because it is now functioning both as the main verb of the sentence and as part of another idiom (to “drop <someone> in it”, ie to cause them trouble). As a commentator might say about a big inswinger that misses all three stumps, this headline is “doing a bit too much”. If “mic drop” needs quotes round it in your tweet, then it needs to be treated slightly more gently the first time it appears in print. (And let’s not even get into whether, for precisely this sort of reason, the abbreviation should be “mic” or “mike”). 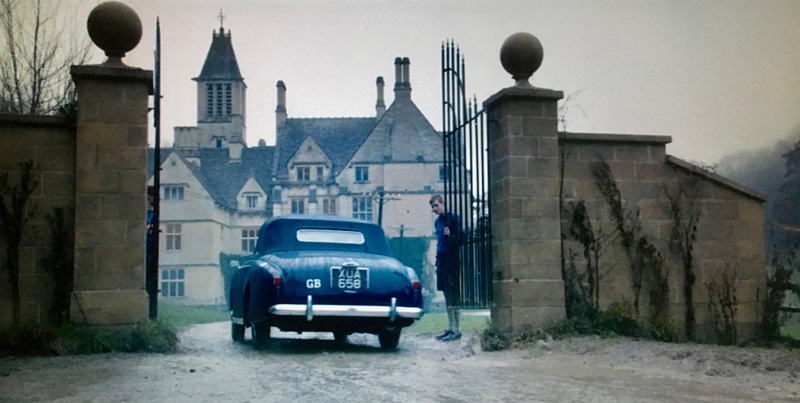 The scene: Windsor Castle in the early 1960s, in the grip of a dramatised royal dispute about whether or not Prince Charles should go to chilly, remote Gordonstoun to toughen him up after primary school. 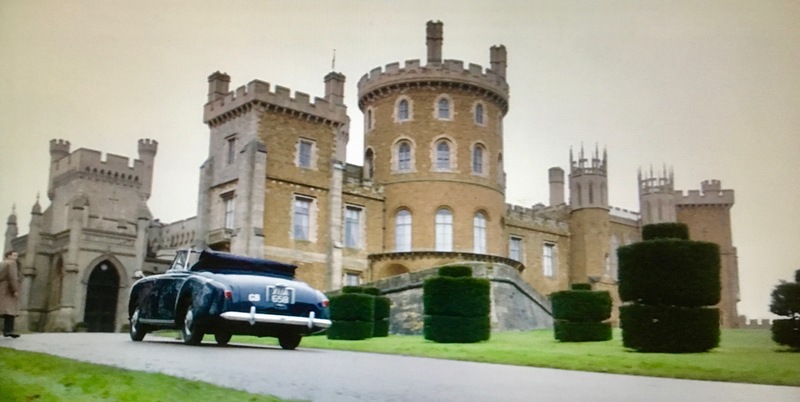 At the height of the debate, the Duke of Edinburgh arrives at the castle in his elegant, powerful Lagonda (this isn’t just The Crown glamourising things for its Netflix audience: he really did have one). 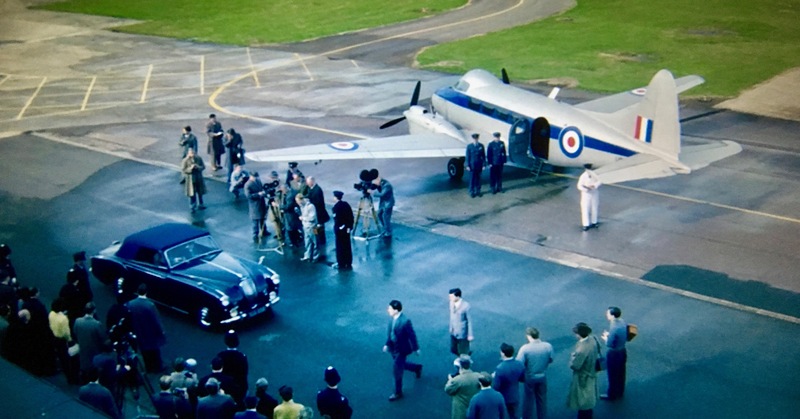 And then cut to: Gordonstoun, where the gates are swung open to welcome the Duke and Charles as they arrive in … er … the elegant, powerful Lagonda, which would appear to have been either taken apart into very small pieces and loaded into the back of the plane, or have made the 550-mile journey from London to Scotland faster than the Duke of Edinburgh can fly. Never mind Santa’s sleigh: whichever royal aide caned it up the M1 at that speed needs to be given a job delivering presents. I’ve always secretly fancied that, as a sub, I might be quite good at film continuity: keeping track of a timeline, checking for inconsistencies, remembering context, organising information: isn’t that what a copy desk does for a living? But in fact, I suspect, a continuity editor’s job is like editing an article by starting in the middle and being forced to read both forwards and backwards, only ever seeing one paragraph at a time, and relying only on your notes to remember which sentence comes after which. Makes deleting “’tis the season” and cutting down the Christmas gift guide to fit on half a page seem very easy by comparison. 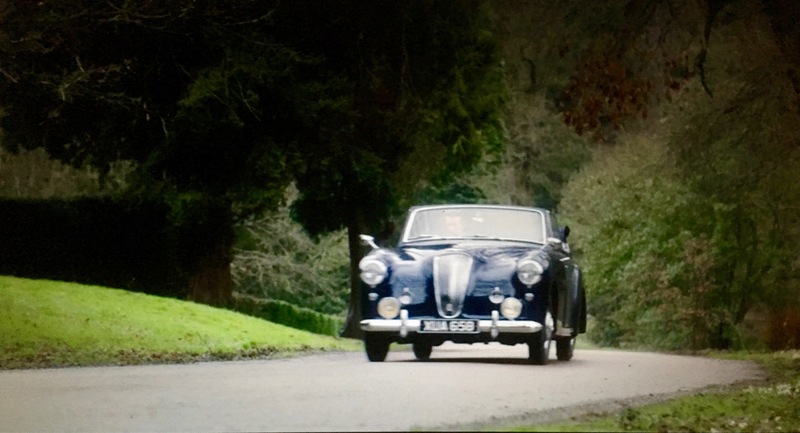 So to editors of all types – from those rushing on set to remove a moustache from the male lead’s face to those with an excited political editor talking in one ear and an excited pre-press supervisor in the other – it’s time to say: happy Christmas, everyone. Here’s to another year of checking up on things.